German au pair Lena wins Au Pair of the Year award. Lena was here for only a week when I realized we had hit the au pair jackpot. IAPA’s Au Pair of the Year contest has been held annually for the past 11 years. 2015 saw a record number of entries from au pair host families all over the world. The essays emphasized the principle at the core of the au pair program: cultural exchange. Three global finalists were chosen and Lena was announced as the winner at the IAPA Annual Conference in Portugal this month. Lena had wanted to be an au pair since she was 13. Throughout her teenage years, she babysat, tutored and worked as a camp counselor in her hometown of Recklinghausen, Germany. Once she was old enough, Lena made the decision to come to the USA through AuPairCare in order to combine her love of children with her desire to experience a new culture. Both Lena and her host family cannot believe how fast Lena’s au pair year has gone by and know that they’ll maintain this relationship for a lifetime. 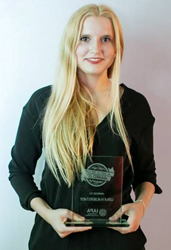 Lena recently traveled to Lisbon, Portugal to accept her Au Pair of the Year award at the 2015 Work Experience Travel Market and IAPA Annual Conference (WETM-IAC). The original essay by the Rasmussens nominating Lena is available on AuPairCare’s website, found here: http://www.aupaircare.com/stories/meet-our-finalist-iapas-au-pair-year-lena-germany. AuPairCare is a leading au pair agency providing affordable live-in childcare services to American families since 1989. Designated by the U.S. Department of State, AuPairCare offers superior childcare to fit families’ unique needs. AuPairCare has matched more than 55,000 au pairs with American families across the U.S. AuPairCare is a division of Intrax, a family of organizations that provide a lifetime of high quality educational, work and volunteer programs that connect people and cultures. Intrax is headquartered in San Francisco with offices on four continents. For more information about AuPairCare, call (800) 428-7247 or visit http://www.aupaircare.com. The International Au Pair Association (IAPA) is the leading global trade association for organizations active in all aspects of au pair and cultural exchange programs. IAPA was founded in 1994 and has more than 170 member organizations in 45 countries worldwide.